If you hear the name “Corvette,” what undersea creature immediately jumps to mind? Stingray, right? That name has been used on and off for over half a century on versions of the American sports car legend. 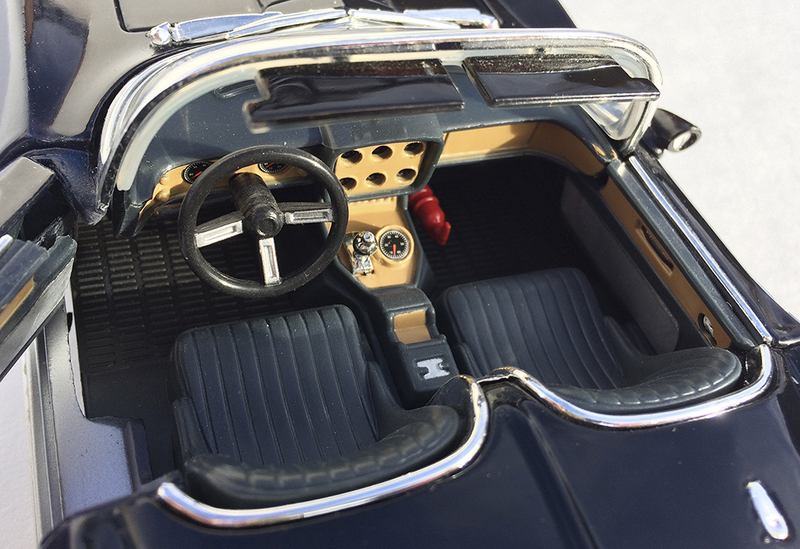 The name first showed up on a 1959 race car, the “XP87 Stingray.” Like many one-off racers, it featured futuristic styling, but no one considered that was a clue to a production car. But this is a story of another creature: the Mako Shark. Bill Mitchell, the new chief stylist at GM, had a thing for sharks, indicated by the giant Mako mounted on his office wall. Inspiration for the new car was not limited to the name… the front of the car featured a sharply pointed nose with a severe overbite. The sides had exposed exhaust pipes resembling gills. 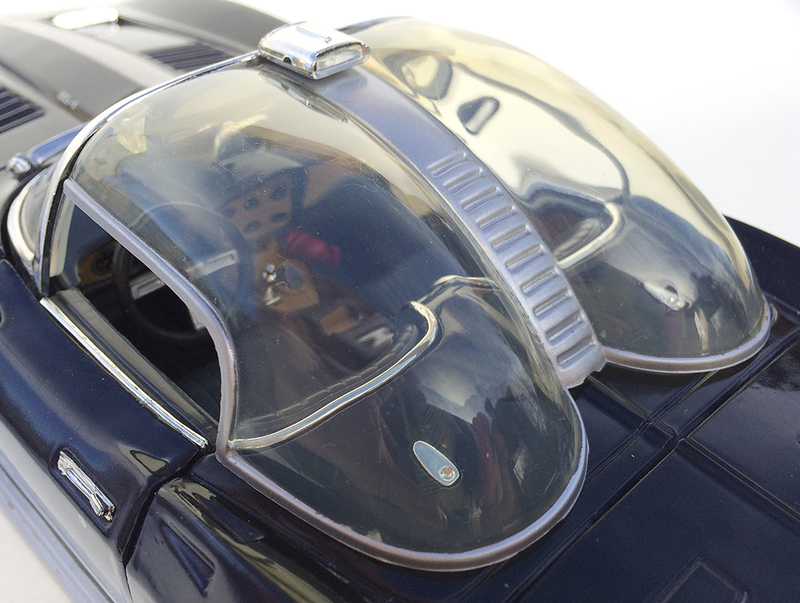 And the profile of the wraparound windshield could be interpreted as a dorsal fin. Furthering the look, dark blue body paint faded into a silvery white belly. It’s surprising there was no attempt to make tail fins to complete the effect. 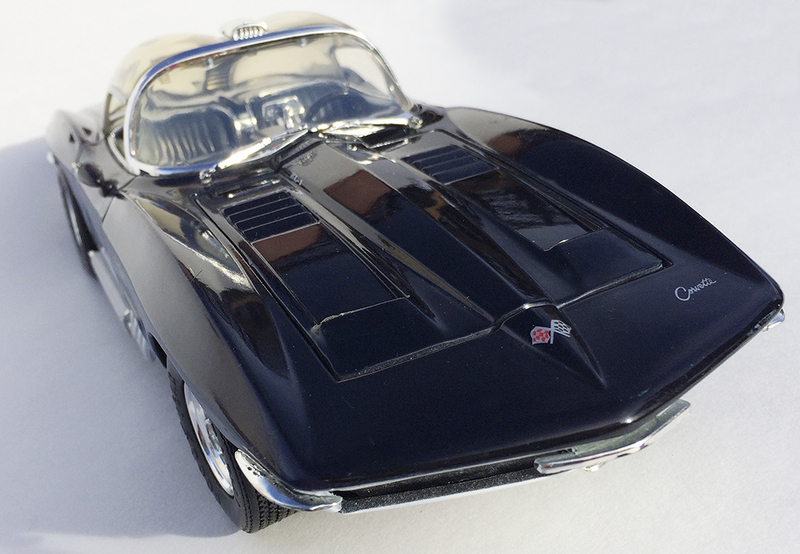 Equal parts ridiculous and awesome, the basic shape predicted the C2 ’Vette, produced from 1963-67. Relatively few scale models exist of the first Shark. Motormax made this inexpensive 1/18 version in the mid ’90s. 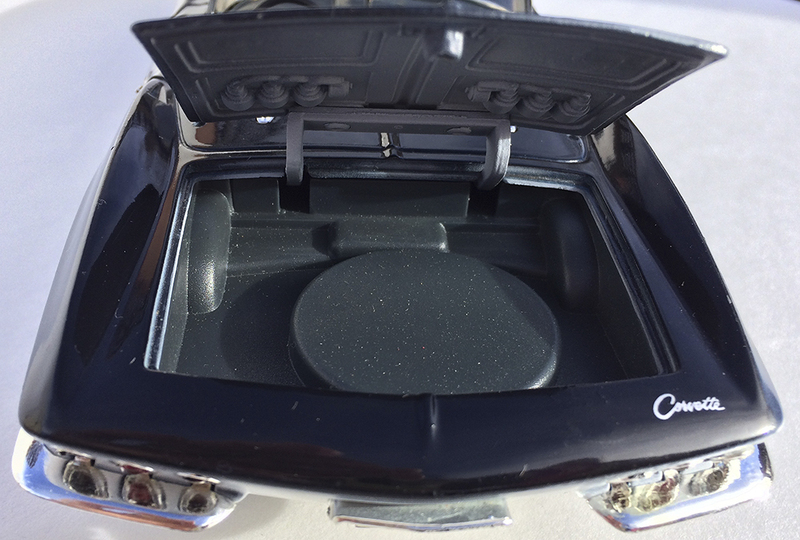 The car comes with the clear double bubble removable top, thoughtfully held in place by the visors to minimize extra tabs and slots. Through that top you can see the spartan interior, with deepset, but readable gauges. Under the forward-flipping hood, the most notable detail is the eight exhaust pipes that travel independently out through the fender vents, connecting at the front of the rocker panels. The trunk opens too, revealing minimal detail, accurate for a running, but not entirely functional, concept car. The hood on the real concept was altered at some point to add even more gills to the design. This and most other models show the later version. The exterior captures the “sharkiness” of the concept with a few flaws that might drive a purist nuts. The splash panels under the nose and tail don’t fit very well, but you won’t see that very often. What does stand out is that crazy fading paint job. The original stylists spent quite a bit of time getting the blue and white tones just right. (According to some tales, Mitchell was never convinced that the hues matched his prized trophy fish, so the stylists stole it from his wall one weekend and painted it to match the car.) The transition from one color to the other should fade at an even height from front to back, but on the Motormax model, it looks like the doors were painted separately, and the fade line is significantly higher than on the surrounding door panels. You could try to repaint it, but you’d lose the emblems and other details on the rest of the car. Best solution? Display it with the doors open, and the line isn’t as obvious. 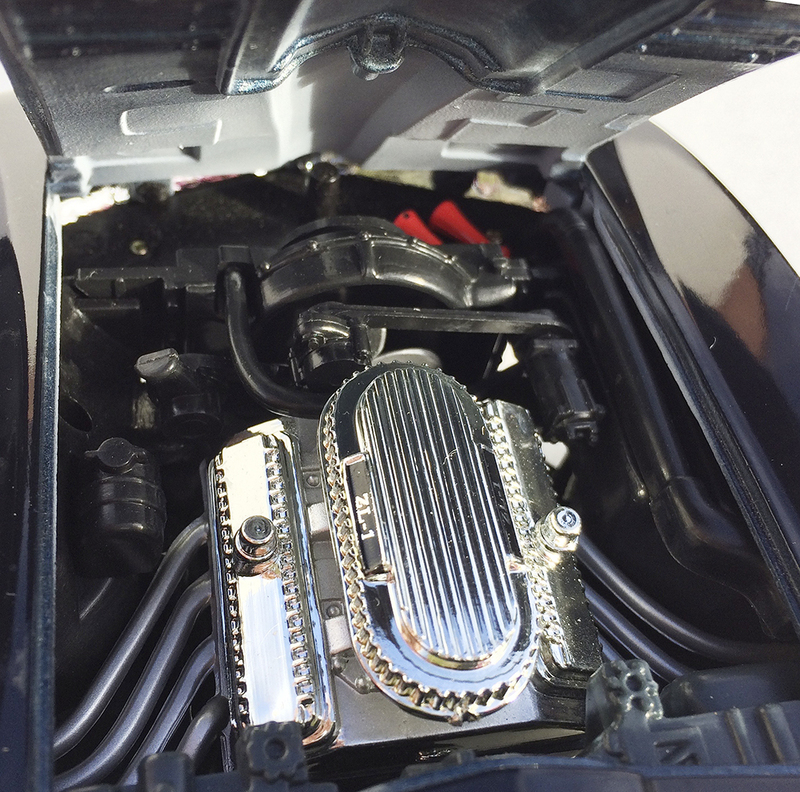 Later, more expensive models, such as the onea from AUTOart and UT Models do a better job with these details. By 1965, only three years into the C2’s production, Chevy started working on the Mako Shark II. We’ll dive into that fish tale another time.